Simon Frith’s Live Music 101 #2 examined the political economy of live music and defined two basic models of performance as a starting point with which to examine the economic transactions between artist, venue, audience, and promoter. 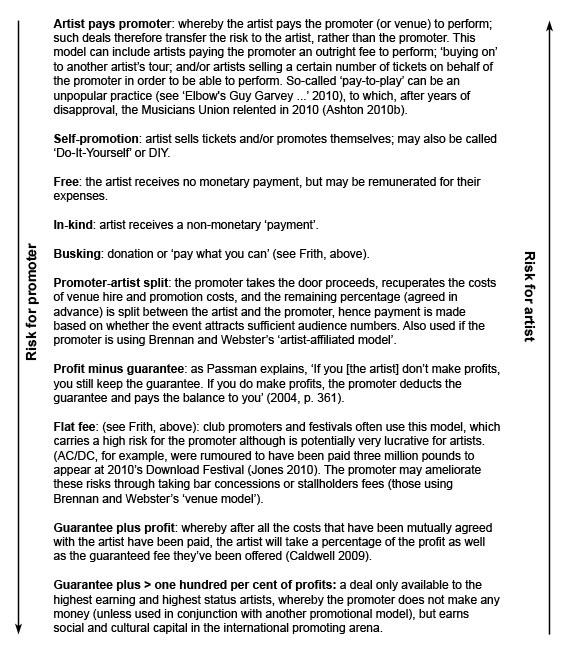 In this addition to the ‘Live Music 101’ series of blog posts detailing the themes and ideas that developed over the course of the initial live music project, Emma Webster offers a model of economic risk that includes the promoter, and also defines three broad ticketing (revenue) models the promoter can use in order to recoup their initial investment. Promoters’ risks may not simply be financial, however, as promoters must also deal with personal and social risks including threats to their reputation and/or their own or others’ personal safety. A folk session ‘host’, for example, runs the risk of not being invited back if the sessions they run are repeatedly poorly attended or managed, which may then impact on their reputation among the folk community, while a promoter putting on a free party in a warehouse may even run the risk of being arrested, which may then subsequently raise their status among particular subcultural communities. In this way, then, risk may ‘constitute opportunities for benefit (upside) or threats to success (downside)’ (Institute of Risk Management 2002, p. 2). A promoter using the ‘pay-to-play’ model, may well be taking a low financial risk but potentially risking a high price in terms of reputation and trust. On the other hand, while a promoter using the ‘guarantee plus > one hundred per cent of profits’ model is taking a massive financial risk, they hope to profit in other ways. Australian promoter Kevin Jacobson, for example, allegedly offered Bruce Springsteen one hundred and one per cent of the gross income for his 1985 Born in the USA tour, the argument being that it was such a high-profile tour that it was worth doing for next to no money simply for the international prestige garnered (Coupe 2003, p. 65). There are also differences within different genre cultures regarding risk; for example, classical orchestral musicians often expect to get paid to rehearse whereas pop musicians generally do not. This also varies from company to company, however, and one event may contain a variety of musicians on different contracts. Scottish Opera, for example, expects its guest soloists to rehearse for no fee and receive payment only for a performance, whereas the orchestra members receive a guaranteed salary (Reedijk 2009). Similarly, crew and touring ‘session’ musicians will often receive a guaranteed fee whereas the artist’s income is likely to be based on ticket sales, dependent on the payment deal. Promoters therefore deal in different types and levels of risk depending on the type of show and the contract with the artist (if used). To recoup their initial investment, a major part of the promoter’s role is therefore to administrate the transaction between artist and audience (if necessary) and there are three broad ticketing (revenue) models the promoter can use in order to recoup their initial investment: ‘free’ (no door charge but promoter may benefit financially from the sale of other products); ‘donation’ (variable income based on what the customer chooses to pay); and ‘fixed’. A free event potentially carries the most economic risks and must be subsidised in other ways, while a fixed ticket price should garner at least some ticket revenue. Within the ‘fixed’ model, economic risks may be further mitigated in a variety of ways, one of which is to charge a variable price for seats based on seat position, or ‘added extras’ such as ‘premier seats’ or meet and greet events. See for example, ‘Live and Unsigned Scam?’ (2010). As of April 2011, however, Scottish Opera’s resident orchestra moved to part-time hours (Miller 2010). Dynamic pricing – or the ‘airline model’ – is a ‘new’ ticketing model that, while not practised at the time of writing, may soon be in use and may well become the favoured model (Ellis 2011). Using this model, the price of the ticket increases or decreases in relation to the demand for the show. Ashton, R. (2010b) MU says pay to play is okay. Music Week [Internet], 23 September. Available from: <http://www.musicweek.com/story.asp?sectioncode=1&storycode=1042646&c=1> [Accessed 6 December 2010]. Caldwell, C. (2009) Personal interview, Glasgow with Emma Webster, 30 September. Coupe, S. (2003) The promoters: inside stories from the Australian rock industry. Sydney, Hodder. Elbow’s Guy Garvey: ‘Something needs to be done about promoters ripping off young bands’ (2010) NME.com [Internet], 13 October. Available from: <http://www.nme.com/news/elbow/53403> [Accessed 6 December 2010]. Ellis, G. (2011) In conversation with Matt Brennan and Emma Webster. The business of live music conference, Edinburgh, 1 April. Institute of Risk Management (2002) A risk management standard. London, AIRMIC, ALARM, IRM. Jones, E. (2010) Festival headliners commanding huge fees. BBC website [Internet], 19 June. Available from: <http://www.bbc.co.uk/news/10356896> [Accessed 6 December 2010]. Live and Unsigned Scam? (2010) Leeds Music Forum [Internet discussion forum], 22 March. Available from: <http://www.leedsmusicforum.co.uk/viewtopic.php?f=7&t=25026&hilit=surface> [Accessed 10 December 2010]. Miller, P. (2010) Scottish Opera players looking for cleaning jobs. Herald Scotland [Internet], 6 November. Available from: <http://www.heraldscotland.com/news/home-news/scottish-opera-players-looking-for-cleaning-jobs-1.1066392> [Accessed 8 April 2011]. Passman, D.S. (2004) All you need to know about the music business. London, Penguin. Reedijk, A. (2009) Personal interview, Glasgow with Emma Webster, 20 October. This entry was posted in Blog, Live Music Theory, Tickets and tagged promoters, revenue models, risk, ticketing by Live Music Exchange. Bookmark the permalink. Note that the plus profit deals require a percentage. So, flat fees are typical at festivals as the percentage becomes too difficult to work out unless you start doing this per attendee i.e. pay x plus y per attendee over an agreed number of attendees. Flat fees may also be seen as higher promoter risk as you’d be expected to pay more than down the percentage route i.e. the option is to pay a flat fee of x, or, less than x but with a percentage involved. The promoter is therefore gambling that they will pay the artist less as a flat fee than if a percentage came into play (is ‘broken’ as it is termed) due to the number of attendees.